It’s been a whole year since I last posted. Sorry about that — I’ve been busy every day on my Facebook page, but the poor blog has been neglected. I aim to remedy that in the new year — so look for the frequency of the FB posts to reduce (maybe to 2-3 times a week instead of every day), and I will aim to keep the blog updated. 2019 begins a new pathway in my life’s journey. I’m getting married on April 20th to the love of my life. Big changes are ahead, and hopefully (prayerfully) a return to Newtonberg will be part of it. But for now — December 17th is my birthday, and as usual I’m giving YOU a present. To get All That Remains free, use coupon code KZ32P at checkout. For Back to Newtonberg, use coupon code HQ26D at checkout. 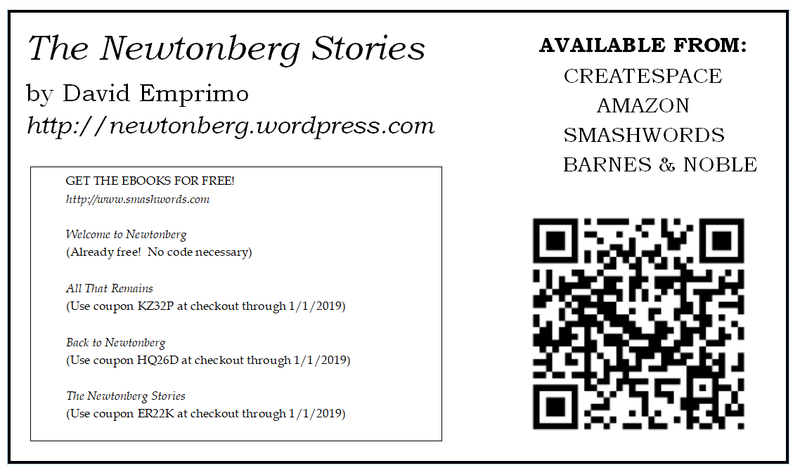 For The Newtonberg Stories, use coupon code ER22K at checkout. Thanks again to everyone for all of your support this past year. I can honestly say that this has been the best, most exciting year of my life. I know I said that about 2017, but 2018 exceeded my expectations — 2019 is shaping up to be even better! I’m a few days late this year. My birthday was actually last week, but once again, I’m giving YOU a present. If you haven’t read my books yet, here’s a special offer: until January 1st, all of my eBooks are FREE on SmashWords. To get All That Remains free, use coupon code HS46W at checkout. For Back to Newtonberg, use coupon code AL23Q at checkout. I hope you don’t mind, but I am foregoing my usual song lyric/post title format this time. In this particular case, I don’t feel it’s appropriate. The importance of someone’s life shouldn’t be reduced to song title. Last night I logged onto Facebook and learned that one of my favorite authors had died. Not Harper Lee — although To Kill a Mockingbird is indeed a classic of American literature. I’m talking about Umberto Eco. I went through the first twenty years or so of my life not ever having heard of Umberto Eco. While I’ve always been a reader, until college I pretty much stuck with American or British authors. To my knowledge, I never read a book that had been translated from another language (aside from Beowulf or some obscure short stories in high school English class). When I took my first job at the public library where I would work for over twenty years, one of my co-workers had worked in the publishing industry as an editor. She seemed very intelligent and sophisticated to me, and I was impressed by her wide knowledge of the various authors in our collection. One day, we were putting books on the cart to reshelve them when I spotted The Name of the Rose among the titles. I recognized it as having been the basis for a Sean Connery movie that I had yet to see, and remarked that the book could be an interesting read. Now at the time, I wasn’t quite sure what she meant by that, but it sounded a little like an insult (whether she intended it to be perceived as such or not). Feeling as if I’d been issued a challenge, I determined that I would read the book anyway, just out of spite. And that’s how I discovered Eco — someone challenged my intellectual ability (or at least, that’s how I perceived it). Thinking back on it twenty years later, they could have been right. At any rate, I am grateful to her. Had it not been for Eco, I never would have discovered other authors I love, such as Jorge Luis Borges, Carlos Ruiz Zafon and Arturo Perez-Reverte. Had it not been for The Name of the Rose, I never would have read Eco’s other books — Baudolino, Foucault’s Pendulum, Numero Zero. I never would have developed my love-hate relationship with The Mysterious Flame of Queen Loana. Because of Eco, I broadened my horizons internationally. I discovered foreign films (La vita è bella, La cité des enfants perdus, Le Fabuleux Destin d’Amélie Poulain), and musicians such as Emma Shapplin, Louis Bertignac, and the participants in the wonderful French annual charity concert Les Enfoirés. Every weekday at work, I receive an e-mail called Shelf Awareness that keeps me up-to-date on book news, new releases, movies and TV shows that are coming out based on books, etc. As a librarian, this is invaluable to keep us on top of what patrons might be asking for. An occasional feature of Shelf Awareness is a “spotlight” section called Book Brahmin. This section highlights new authors, or established authors with new books coming out. Just for fun, I thought I might do my own Book Brahmin “interview”, using the questions from the latest installment as the basis. My Kindle, which contains about 100 or so books at any given time, including the complete Murder She Baked series by Joanne Fluke, a lot of Stephen King, Umberto Eco, Carlos Ruiz Zafon and a ton of biographies/autobiographies. One or two real books make appearances there, mainly biographies or books about music, movies or comedy. Morris’s Disappearing Bag by Rosemary Wells when I was really young, The Kids’ Candidate by Jonah Kalb when I was a young teenager. In no particular order: Umberto Eco, Stephen King, Carlos Ruiz Zafon, Joanne Fluke and Mick Foley. Probably either The Club Dumas by Arturo Perez-Reverte, or The Shadow of the Wind by Carlos Ruiz Zafon. Although I do feel a particular need to defend Mick Foley as an author. The man can write, and he knows how to tell a story in a way that totally immerses the reader. I don’t think I’ve ever bought a book just for the cover. I’ve browsed a few because of the cover, but I always read some of it before I decide to buy it. “The most important things are the hardest things to say. They are the things you get ashamed of, because words diminish them — words shrink things that seem limitless when they were in your head, to no more than living size when they’re brought out. The Asylum for Wayward Victorian Girls by Emilie Autumn. I really wish this was available — text only — for the Kindle. There is an official PDF version available, but it’s over 1GB in size! While I appreciate Emilie’s devotion to her artwork, it was the text that drew me into the story, not the artwork. Back to Newtonberg again. I’m doing research for a few story ideas right now. Probably another collection of short stories unless one of them just screams to be told as a standalone novel. We’ll see what happens when I start writing.